Although the White Cliffs of Dover have inspired scores of poems and songs, make no mistake: It’s the delicate Dover sole found in the waters below the cliffs that have inspired the palates of fish-gourmands worldwide. Dover sole are prolific fish. Bottom-feeders that swim along the ocean floor and can grow to over 2 feet long, they often live as long as 58 years. Just as delicious as they are long lasting, Dover sole are among foodies’ most sought after fish. In fact, because they’ve become so popular, there are fewer sole being fished out of the waters near the English Channel these days, and more from fish farms in the Netherlands, as well as from other European waters, including the eastern Atlantic Ocean and the Mediterranean Sea. The tasty flounder, however, still bears the name of the English port where the most sole were caught during the 1800s. Here in the United States, you’ll often find Pacific sole — from the waters off the West Coast — being marketed as Dover sole. Don’t let the name fool you, though. It’s a different fish entirely, and a more inferior one thanks to its thinner fillets, which sell for considerably less than European sole. No. If you want the good stuff, you’ve got to look for fish from across the pond — and for authentic Dover sole from the English Channel, if you can find it. While it’s more expensive than the American variety, it’s also meatier and more delicate, making it well worth the extra money. 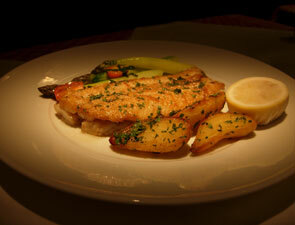 Think of the Dover sole as the porterhouse of fish. An excellent source of low-fat protein and calcium, it doesn’t need a lot of extras to make it delicious. In fact, it tastes wonderful with very little seasoning, and just dazzles when prepared with the bones in. Don’t bone the fish, as doing so will dry it out. Gently herb both sides of the fish gently; parsley is a popular choice. Finally, flour the fish generously before cooking it in oil or butter — or both — in a sauté pan or skillet. However, you prepare your Dover sole, you’ll be glad to know it’s available fresh as well as frozen all year long. What’s more, says Harold McGee, author of On Food and Cooking, unlike many common fish that should be frozen or eaten right away, true Dover sole “has a fine-textured, succulent flesh said to be best two or three days after harvest.” So Dover sole isn’t just delicious. It’s also convenient!